There are many books and websites on how to build ones own wood-fired brick oven, they are all extremely good and very informative, however, they all suffer a similar draw back – if you have a question, who can you ask. James had the idea of working out how to build a brick oven after visiting Pompeii some time ago and with this friend Jim built the first Pompeii oven. Through Forno Bravo he made available his and Jims experiences. Now through the Forno Bravo web site you can use the Forno Bravo Forum a place where like-minded oven builder and users talk about their experiences. We recommend this as the first step to building your own oven. Try the Pompeii Oven Building Plans page where you can read about the concept of building your own brick oven. 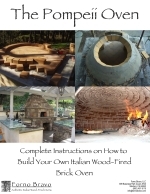 Then visit the Forno Bravo US store where you can down load the Pompeii Oven Instruction e-Book and several other e-Books dedicated to wood-fired cooking. The e-Books are made available online by Forno Bravo, however, they are the creation of Forno Bravo and many people from the Forno Bravo forum who dedicated their time and knowledge to these publications. The e-Books are free, however, as an appreciation of the many hours dedicated to their creation by members of the forum we would ask you to down load the Habitat for Humanity e-Books (at the bottom of the page) for $10. Forno bravo will then pass on the whole $10 to Habitat for Humanity. Here we have made available some suggestions, notes and photos for building your own brick oven. They are from our own experience of building ovens here in the UK.